Due to austerity measures in effect during World War II, the inauguration was held on the South Portico of the White House, rather than the Capitol. The parade and other festivities were canceled as well. The oath was administered by Chief Justice Harlan F. Stone and the subsequent address was one of the shortest on record. This was also the last time that the outgoing Vice President swore in his successor, which had previously been the practice. The first inauguration of Franklin D. Roosevelt as the 32nd President of the United States was held on Saturday, March 4, 1933. The inauguration marked the commencement of the first four-year term of Franklin D. Roosevelt as President and John Nance Garner as Vice President. It was the last inauguration to be held on the constitutionally prescribed date of March 4; the 20th Amendment, ratified in January 1933, moved Inauguration Day to January 20. As a result, Roosevelt's first term in office was shorter than a normal term by 43 days. The second inauguration of Franklin D. Roosevelt as President of the United States was held on Wednesday, January 20, 1937. The inauguration marked the commencement of the second four-year term of Franklin D. Roosevelt as President and John Nance Garner as Vice President. 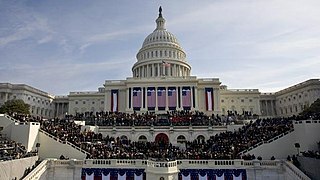 It was the first inauguration to take place on January 20 as per the 20th Amendment to the U.S.Constitution. This was also the first time the Vice President took his Oath on the Inaugural Platform during the ceremonies. The second inauguration of Harry S. Truman as President of the United States was held on Thursday, January 20, 1949. 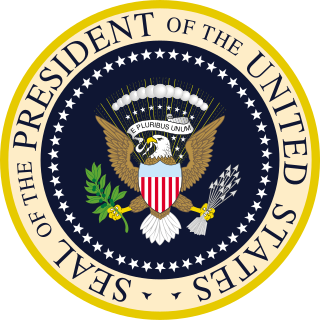 The inauguration marked the commencement of the second term of Harry S. Truman as President and the only term of Alben W. Barkley as Vice President. Chief Justice Fred M. Vinson administered the Oath of office. The third inauguration of Franklin D. Roosevelt as President of the United States was held on Monday, January 20, 1941 on the East Portico of the United States Capitol in Washington D.C.. 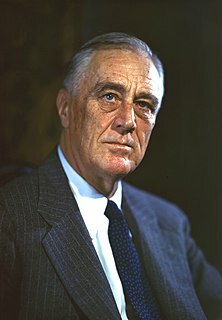 The inauguration marked the commencement of the third four-year term of Franklin D. Roosevelt as president and the only four-year term of Henry A. Wallace as Vice President. This was the first and only time a president has been inaugurated for a third term. The first inauguration of James Madison as the fourth President of the United States was held on Saturday, March 4, 1809, in the chamber of the House of Representatives at the United States Capitol in Washington, D.C.. The inauguration marked the commencement of the first four-year term of James Madison as President and the second term of George Clinton as Vice President. The presidential oath was administered by Chief Justice John Marshall. The President wore a 100% American-made wool suit, and the first official inaugural ball occurred at Long's Hotel, with ticket prices being $4. Clinton died 3 years, 47 days into this term, and the office remained vacant for the balance of it. The second inauguration of James Madison as President of the United States was held on Thursday, March 4, 1813, at the United States Capitol in Washington, D.C.. 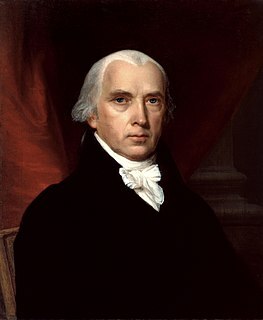 The inauguration marked the commencement of the second four-year term of James Madison as President and the only term of Elbridge Gerry as Vice President. The presidential oath was administered by Chief Justice John Marshall. Gerry died 1 year, 264 days into this term, and the office remained vacant for the balance of it. The second inauguration of William McKinley as President of the United States was held on Monday, March 4, 1901. The inauguration marked the commencement of the second term of William McKinley as President and the only term of Theodore Roosevelt as Vice President. McKinley died 194 days into this term, and Roosevelt succeeded to the presidency. The inauguration of Franklin Pierce as the 14th President of the United States was held on Friday, March 4, 1853 on the East Portico at the United States Capitol in Washington, D.C.. The inauguration marked the commencement of Franklin Pierce's only four-year term as President and William R. King's only term as Vice President. Chief Justice Roger B. Taney administered the presidential oath of office. Pierce affirmed the oath of office rather than swear it, and was also the first president to recite his inaugural address from memory. The first inauguration of Grover Cleveland as the 22nd President of the United States was held on Wednesday, March 4, 1885, at the eastern portico of the United States Capitol in Washington, D.C.. The inauguration marked the commencement of the first four-year term of Grover Cleveland as President and the only term of Thomas A. Hendricks as Vice President. Hendricks died 266 days into this term, and the office remained vacant for the balance of it. The second inauguration of Theodore Roosevelt as President of the United States, took place on Saturday, March 4, 1905. The inauguration marked the beginning of the second term of Theodore Roosevelt as President and the only term of Charles W. Fairbanks as Vice President. The Chief Justice, Melville W. Fuller, administered the Oath of office. 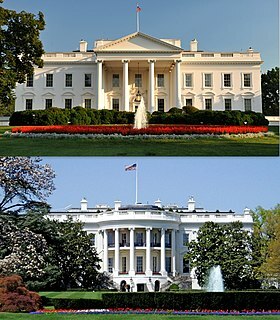 The first inauguration of Woodrow Wilson as the 28th President of the United States was held on Tuesday, March 4, 1913, at the east portico of the United States Capitol in Washington, D.C.. The inauguration marked the commencement of the first four-year term of Woodrow Wilson as President and of Thomas R. Marshall as Vice President. Chief Justice Edward D. White administered the presidential oath of office to Wilson. The second inauguration of Calvin Coolidge as President of the United States, was held on Wednesday, March 4, 1925 at the eastern portico of the United States Capitol in Washington, D.C.. 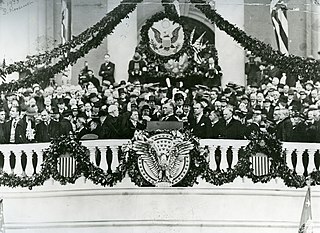 The inauguration marked the commencement of the second term of Calvin Coolidge as President and the only term of Charles G. Dawes as Vice President. The Chief Justice, former president William Howard Taft administered the presidential oath of office. This was the first inauguration in which a former U.S. President administered the oath, and the first to be broadcast nationally on radio.